Why do marketers like to shout at us that something is “NEW AND IMPROVED!”? It sometimes makes one wonder just what the heck was wrong with the old thing that needed improving? A favorite breakfast cereal of ours underwent this treatment recently. NO! We wanted to shout. We liked the old cereal just fine, why change it? Just what needed to get better? Happily we noticed no difference, which left us to wonder what it fact was improved. Was it the time it took for the flakes to get soggy, the box design perhaps, more vitamin C? Sometimes the “NEW AND IMPROVED” is simply a marketing ploy, a way to trick consumers to become more “brand” aware. Whatever the reason, the truth is that being “NEW AND IMPROVED” isn’t always necessarily “NEW AND IMPROVED”. Sometimes it’s actually “REPACKAGED AND MADE TO LOOK NEW” without actually being “IMPROVED”. Auto manufacturers never call something “NEW AND IMPROVED”. Cars get “refreshed” or redesigned. In some instances the “refresh” results is very little actual change or improvement. Yet, the marketers try and convince us otherwise, screaming to the heavens that the XYZ Sedan is all NEW for this year!! When actually it’s not. Sometimes however, automakers can do a refresh without shouting at us and actually make good changes. Hyundai did just such a thing; refreshing their Genesis line for 2015, and for once a carmaker made just enough changes to hit a perfect bulls eye. The first occasion we had to drive a Genesis was the 2013 3.8. Overall we weren’t all that impressed. It was as if Hyundai was trying to compete with the high-end luxury sedans, Mercedes, Lexus, the Audi’s. The Genesis then was like going to Wal-Mart to buy a pair of Nikes except they aren’t really Nikes, they just look like it, sort of. We got behind the wheel of the refreshed Genesis late last year. The 2015 3.8 model was impressive. The design changes both outside and inside seemed to bring the model up on a more even playing field with the Mercedes and the others. Even the new winged badge added a touch of class not present in earlier models. So it was that recently when told we would be getting a 2015 Genesis again we knew it would be a good thing. However, what we got was the 5.0, a bigger engine, and loaded with just about every available gadget and doo-dad Hyundai offers. What we got was a good thing made even better. 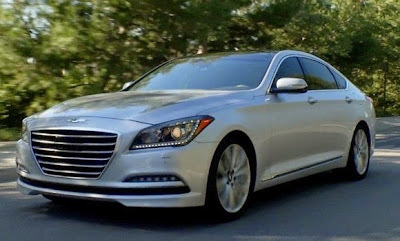 The Genesis is largely unchanged for the 2015 model year. The 5.0 has the 5.0-liter V-8 engine with direct injection mated to an eight-speed automatic transmission in a rear wheel drive arrangement. 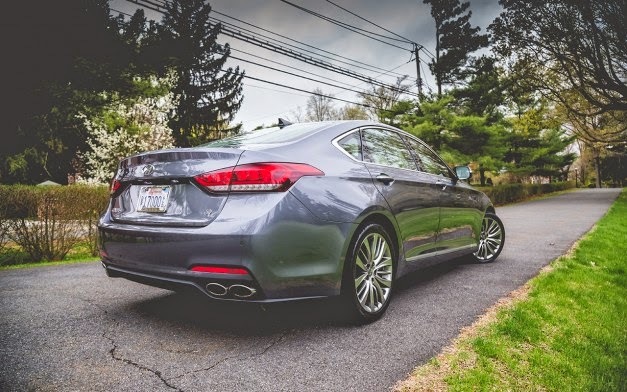 The only major difference is that the 2015 Genesis Sedan 5.0 is rated at 420 hp and 383 pound-feet of torque, that’s down a tick on the horses, but with 18 pound-feet more torque. Interior-wise the layout, as we had in our 2015 3.8, is well planned with quality materials and fit. The cabin really does feel open and the overall design very user-centric. We had the Ultimate package that gave us a 9.2-inch high-definition touchscreen display for the infotainment/navigation system. Honestly speaking the system is one of the easier ones to use and can be operated via the touchscreen or a dial on the center console. There was also a Heads-Up Display in our model. The interesting thing was the colors which can be set to white, orange or green. The white HUD reportedly washes out when wearing polarized sunglasses, so the additional colors should be the work-around. The Genesis is also load with tech and safety equipment. The standard features include wheels, a rearview camera, automatic headlights, , heated mirrors, automatic wipers, cruise control, automatic climate control, keyless ignition and entry, heated eight-way power front seats with four-way power lumbar, leather upholstery, a tilt-and-telescoping steering wheel, an auto-dimming rearview mirror. There are three option packages: Signature, Tech and Ultimate. We had the Ultimate which includes everything in the Signature and Tech packages including a panoramic sunroof, auto-leveling HID headlights, auto-dimming exterior mirrors, high-intensity headlights, blind-spot detection and rear cross-traffic alert systems, automatic high beams, adaptive cruise control, a lane-departure warning system with lane-keeping assist, front and rear parking sensors, an automatic emergency braking system. 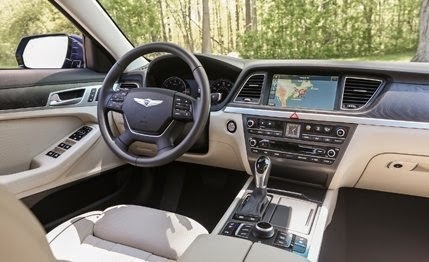 There is also upgraded leather upholstery, more driver seat adjustments (cushion extension and side bolsters) and an upgraded 7-inch display for the gauge cluster. The Ultimate package adds a power trunk lid with sensor for hands free opening; dual-zone automatic climate control, an upgraded navigation system with a center console multifunction controller and the bigger display, matte-finish wood and aluminum trim, a carbon dioxide sensor for the climate-control system and a Lexicon 17-speaker surround-sound audio system. The driver selectable Intelligent Drive Mode gives three options: Normal, Eco and Sport (a Snow mode is added for all wheel drive models). Our 5.0 had the Continuous Damping Control (CDC) suspension which is one of the first things we noticed that was different from the 3.8. On the road the ride seems a little smoother, the interior a bit quieter and the available power seems to be in tune with the overall car. The power we had in the 3.8 was quite adequate, but just so. The addition of two cylinders seems to do the trick. While this isn’t a sports car and won’t really drive like one, when needed the 5.0 will put you back in our seat and the paddle shifters will allow for manual control if needed. We liked the 2015 3.8 we had last year, we liked the 5.0 even better. It may not sway a Mercedes buyer away (a Hyundai, you must be joking!) but for those looking for a nice luxury sedan with the power of a Mercedes or a Lexus the Genesis is worth a look. After a few years of climbing upwards, we can finally say that Hyundai is now a legitimate player in the luxury sedan market, and that is a very good thing indeed. Front head room: 41.1 in. Front hip room: 55.7 in. Front leg room: 45.7 in. Front shoulder room: 58.3 in. Rear hip room: 54.8 in. Rear head room: 38.2 in. Rear leg room: 35.0 in. Rear shoulder room: 57.1 in.